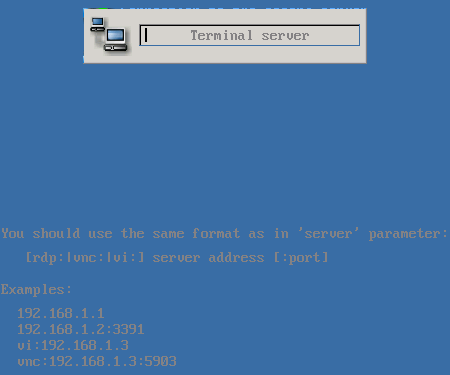 Such configuration file means, that after boot terminal will automatically connect to terminal services on 192.168.1.1 server. In configuration file you may specify many other parameters, all of them you will find in this manual with descriptions. Menu allows to select one connection from the list. 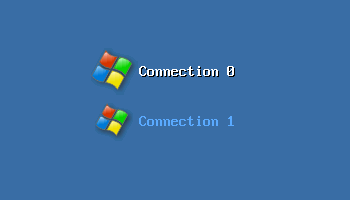 To connect to another server you are to disconnect from selected server — shutdown current connection — and return to menu. On the first virtual screen — menu with four items. On the second screen — embedded Google Chrome (requires 1Gb RAM on terminal, doesn't work on Raspberry Pi). On the third virtual screen — connection to 10.1.1.83 server. 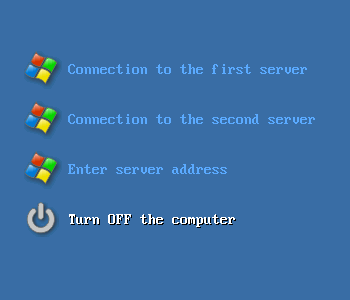 On the fourth virual screen — interface for entering terminal server address.